But inside your mind is the same equipment… very same resources that every musical genius who ever lived has inside their mind. Well, the answer is: they use their resources… their equipment in a different way to you. 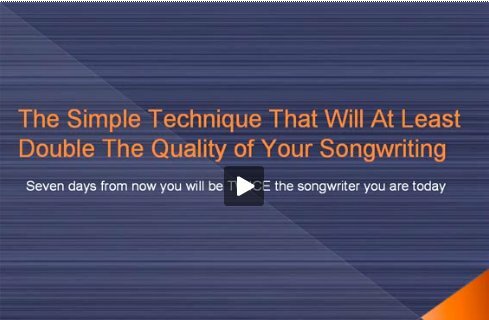 I want to say that again because it's actually the key to making incredible leaps and bounds in your songwriting. A musical genius uses their resources in a different way to the average songwriter or musician. You see, there are certain patterns of thought… certain "ways of thinking" that are very effective for writing amazing songs and inspirational music. If you can change your thinking to match this new, more effective way, then you too will get staggering results when you compose your own music. Now, as a gift to you I would like to give you access to a chapter of my book "The Songwriting Genius Within You". This chapter will give you some very interesting insights into why the great songwriters and composers can effortlessly churn out masterpieces… and it will also give you the understanding of how you can do the same when you compose your own music. A musical genius thinks and acts in a very specific way. Just pretend for a moment that you’re sitting in a room with a master songwriter, who is before your very eyes, creating a musical masterpiece. As you watch this person, they are thinking and acting. There is something that is going on inside this musicians mind (thinking) that is allowing them to create this music, by either playing it or recording it in some other manner (the acting). The exciting thing is, if you know what’s going on inside of this musicians mind, AND you can adopt this way of thinking, then you can create similar breathtaking results as you compose your own music. In this course, you are going to learn about the way that a genius musician thinks and acts. You will also be given training that will allow you to adopt this method of thinking and acting. Once you do this, you will be able to have musical ideas that you are not capable of having now, and playing them in a way that you couldn’t dream of doing at present. Now the way a great musician thinks and acts isn’t simple. It’s not completely straightforward, and it does take practice to adopt this new way of thinking and acting. But I promise you that if you practice this, you will get it. You will be able to see music in a way you’ve never seen it before. In this course, you will learn to operate your “musical software” in the way that a musical genius does. You will learn how to generate musical ideas the same way. You will learn how to compile your ideas the same way. You will learn how a musical genius decodes his musical ideas and how you can do this too. A musical genius also has “music software” running inside their head. So what’s the difference between your software and the genius’s software? Well, it’s the way he uses his musical software. The good news is that your equipment isn’t different from the musical geniuses. The difference is in the programming. Even better, if you can re-program your software to match the musical geniuses software, you will begin to get similar results in your songwriting! Here’s an example to help make this clearer. A musical genius has the ability to hear a note and immediately know what this note is. This skill is known as perfect pitch. The reason this person can hear a note and immediately know what it is isn’t because he has some kind of magical ear. It’s because he has for some reason or another developed this skill naturally. He’s stumbled upon a way of thinking that allows him to pick pitches easily. Now, perfect pitch is an element in your music software. If you can’t hear different notes easily at present, you can still be taught a way of thinking that will allow you to develop perfect pitch. This is just one example of how a musical genius has naturally developed “music software” that allows him to create a never ending flow of wonderful music. Another element of his “musical software” is the way he generates ideas. This “idea generation” has a lot to do with engaging the creativity process. One of the biggest differences between a “genius” and the average musician, is the genius has stumbled upon a way to engage the creativity process and draw deep from their creative resources. The average musician however tends to create ideas in a more “analytical” method, using their conscious mind to try and mold ideas. A large part of this course is dedicated to teaching you how to “short circuit” this analytical part of you and allow your deeper creative resources to “take over” the idea generation process. In this course you will learn each element in your “music software”. After this you will learn how you can use each element of this software more like our “musical genius” friend. As you master each part of your “music software” your results as you compose your own music will become more and more like those of a musical genius. It’s a very interesting that there is a growing mass of evidence suggesting that the “geniuses” of the world get their rare results only because they’ve stumbled upon a much more effective way to use their resources. By adapting the “musical software” of a genius, you too will learn to use your resources in a much more effective way, which will result in the creation of a sea musical inspiration that will truly change your life. To Discover How To Compose Your Own Music To An Exceptional Standard Click Here.